The move is in large part due to Trump’s executive order last week banning immigrants from seven majority-Muslim countries. Amir Moravej, founder of Botler, is himself an immigrant from Iran, one of the seven banned countries. After completing his studies as an international student at Concordia University, like many young programmers he figured he would eventually end up in Silicon Valley. But after he gained experience working as a developer at such Montreal startups as Retinad, Relevant (then called Dashbook), nTerop, he realized if he wanted to venture out on his own, Montreal was the place to be. He intended to apply for permanent residency in Canada, but ended up applying too late. He would have participated in the Canada Business Start-Up Visa Program, but it wasn’t available in Quebec back in 2013. Out of options, he was forced to return to Iran, where he began the arduous and research-intensive process of figuring out an immigration application. After discovering the sheer amount of information and the difficulty in sifting through it all to find what was helpful and relevant to his situation, he wrote a simple program to help do some of the work for him. That’s when he decided to open it up to others in the same situation. While the original plan was to publish the bot at the beginning of the April, Trump’s executive order last week caused them to speed up their timeline. 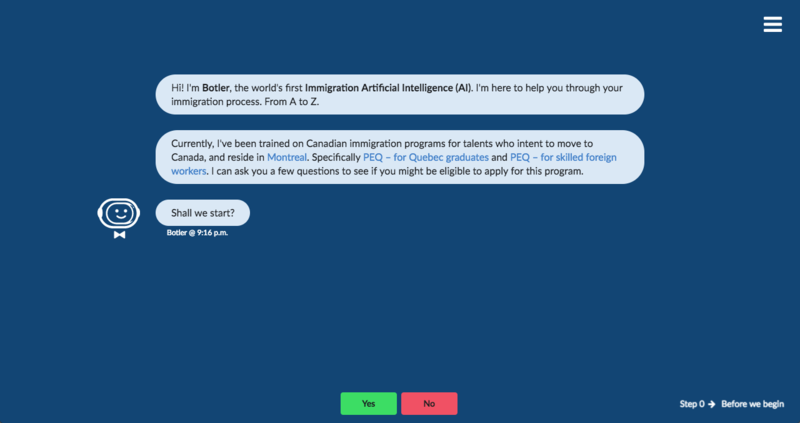 Since winning Startupfest last July, Moravej and his team have been focusing on building Botler so that in some ways it can replicate the functions of a lawyer, helping immigrants through the process. The third step is to fill out the application form, something that’s also very tricky. It’s difficult to find a lot of information about the forms and the forms are very complicated. So the bot will fill out the forms for candidates completely automatically. Botler is launching at Notman House tonight at 6 p.m. It will be able to assist those currently working or studying full-time in Quebec who wish to apply through the Quebec experience program (PEQ) is currently absolutely free through botler.ai.